I recently read an article in the Washington Post about the documents verifying sale and “shipment” of Solomon Northrup, the author of the memoir, and now Oscar winning film, 12 Years a Slave. The excitement, and validation, of reading an ancestor’s name written in that old-style, curly, elegant handwriting, on a century’s old document reminded me of my experience as a part-time, amateur genealogists conducting my own family research. 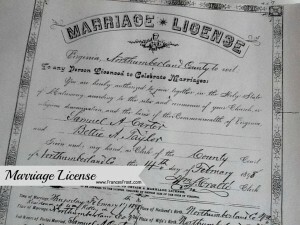 I literally almost screamed when I finally found my family listed in census records, and cried when I eventually located the actual marriage certificate of my great-grandparents, bearing their “X”s, in a courthouse in Virginia. Even my mother was impressed. I mention the idea of knowing your family’s history in my novel, Life in Spades, as one of the characters tours a family plantation. Check local courthouses for personal records such as marriage licenses, birth certificates, and death records. In case you have been inspired to look up your family, here are a few lessons learned from my time spent in the National Archives and country courthouses. The Census is a good place to start, to give you a general picture of where people were when and with whom. The records will tell you who is in the household – head of family, spouse, children, anyone else living there, family or not, and all their personal data – age and/or birthday, occupation, race, number of children, etc. This information is free in the National Archives and you get to use those microfiche skills you learned in school that you always wondered when you would ever use (yes, I’m telling my age there). 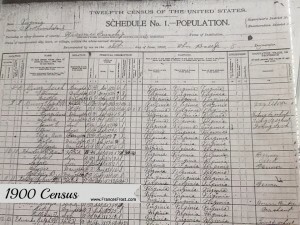 The 1900 Census provides plenty of personal date: names, relationships, race, age, place of birth, relationships, occupation, literacy, and home ownership. Select which side of your family you are going to work on – maternal or paternal, before you even start your research. Write out in chronological order as much information as you know – names, ages, cities lived in, spouses, children. Make notes of information you aren’t clear on – “maybe married” “about 25 years old.” On my first days sitting in the National Archives, I became very frustrated not being able to find anything about anybody, but finally realized I was looking in the wrong cities at the wrong times for the wrong people. Organize everything. I had a binder and folders, with a tab and sections for each family name. I kept a family tree, that I updated, in the front of the binder. Once you get through several generations and several branches, it can get confusing. Especially once you realize that folks in each generation were all named after the same ancestors. Our family has at least one James, Joseph, and William on every branch. If you are using a software system (and I advise that you do if you are doing this seriously) each person will be given a code to distinguish between granddad Samuel, Uncle Sam, and cousin Sammy. Use blank census forms for note-taking. Read several pages from your family’s census listing. 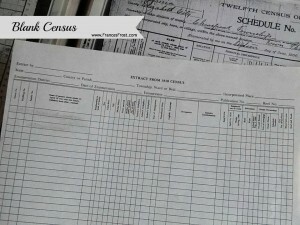 Old census were taken by a person who went from house to house, so above and below your family will be their neighbors. It was common for families to stay near each other, or perhaps, you will find that your ancestor married their neighbor – now you have all of the “in-laws” information, too. As an added bonus, you may find the census taker’s notes on the records; I have one with “Mulberry Street” scribbled along the side. Use several sources to verify information. Just because your family name is Blacksmith and you find a Blacksmith in the records, look for other proof that that is your family. Ages, occupations are pieces of information that can help. Use historical data and maps to help you figure out your story. Searching for records in Richmond, Philadelphia? It would be helpful to know when there were major battles and what buildings and records were lost in fires. Male ancestors in their late teens or twenties during the 1910s, 1940s? You might look for military records, too. This one stumped me – why don’t the older relatives have Social Security numbers? I’ll let you do the research on that one. Make some smart assumptions and follow that lead. 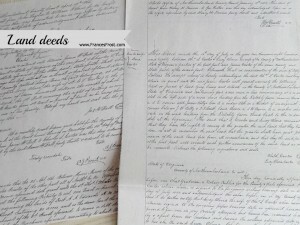 I found a deed of sale for a parcel of land, purchased by a White man with the same name as several of my ancestors in the county my family is from, in 1880. County records list the property as a plantation. Is this the home and employer, or plantation and owner, of my father’s ancestors? Land records provide useful information about location and ownership. Fill in your statistical date with family stories from your living relatives. The records will show your family moved from North Carolina to Pennsylvania, but your relatives will tell you why. Your research may spark some memories, hopefully pleasant ones. And the stories will add life to your research. Who knows, all your notes and research may become your next book. Are you inspired or have you already started researching your family? Let me know in the Comments.